From the moment you contact Premiere Casino Parties to the time your party is over, you can rest assured that we will work hard to make your efforts to throw a great party as easy as possible. With a combined 34 years of party planning and casino dealing , Robert and Linda have the experience and knowledge to help you through every step and keep you within your budget. From delivery and set-up to tear down, attention is paid to every last detail to make your party the "hit of the year". We want your guests to walk away saying your party was the most fun they have ever had outside of Las Vegas! With our brand new tables, new Bunn frozen beverage machines and new state of the art music equipment, you can be assured that no expense has been spared so that your guests will be impressed, not only with the great time they have at your party, but with the professionalism of our company. We can serve any size party from a few to a few thousand. From small birthday parties to giant corporate events, Premiere Casino Parties and Beverage is the #1 choice for Las Vegas style entertainment. Having a fundraiser? Call Premiere. Getting Married? Call Premiere. 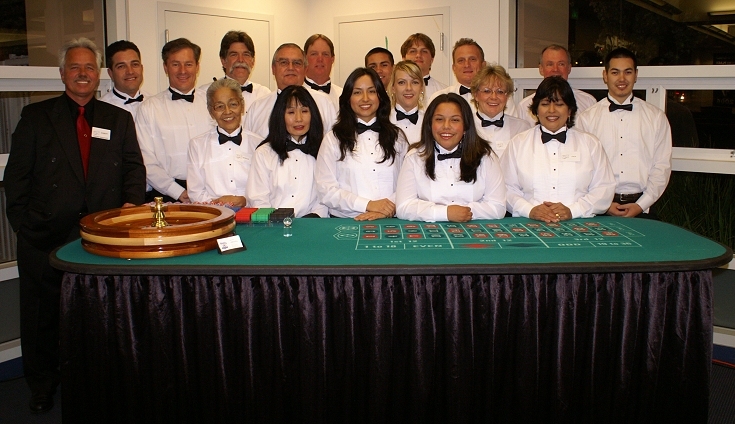 Monte Carlo Night, Grad Nights, Bachelor Parties, Poker Parties and Tournaments, Theme Parties, Holiday Parties, Corporate Events & Functions, Sales Promotions, Product Launching, Charity Events, Company Parties, Reunions? Call Premiere! Don't forget to ask for a list of our well known clients and references. We are highly recommended, repeat vendors for some of the Bay Areas biggest and most prestigious companies.